What is the main difference between traditional makeup and airbrush makeup? The way the product is applied is the key distinction between the two beauty services. Traditional makeup is applied by hand and it can be worked into the skin with a brush, beauty blender, or sponge. The finish of traditional makeup can vary from a natural dewy glow or a matte full coverage based on the formula. Many traditional products such as powder, bronzer, and blush can be used in conjunction with traditional foundation. 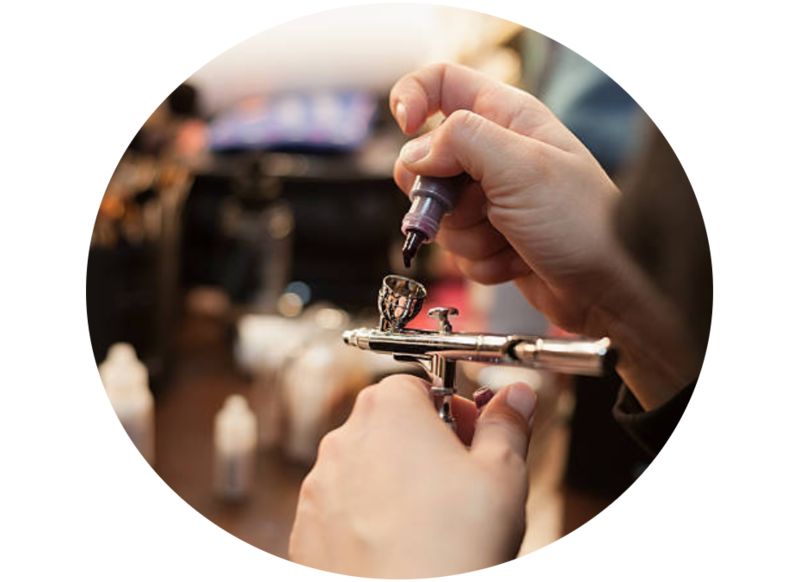 Airbrush makeup is a fine mist of controlled air that pushes out color (foundation) with an air compressor and gun. The foundation consistency is thinner than your traditional foundation allowing for a soft mist and steady stream of air to create an even product finish. The foundation can be sprayed onto the face for a flawless coverage and long wear. The makeup can also be applied with the intention of a soft natural look. 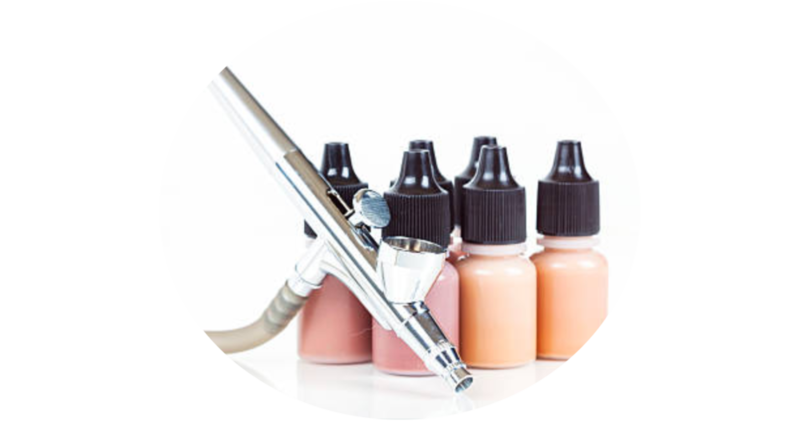 Different airbrush products can be used for foundation, bronzer, blush, and highlight. Think of it as a fun approach to extended wear foundation. Example 1: Shows the difference between traditional bridal makeup and airbrush bridal makeup after 3 hours of wear. Both achieving a natural finish. Example 2: Shows the difference between traditional makeup and airbrush makeup after 4 hours of wear. Both achieving a full flawless coverage. Some ladies are under the impression airbrush makeup only provides a light natural finish and others have suggested the product only gives you a heavy finish. I say, it's all in the artist behind the application. Imagine if you were spraying paint across a white wall in your bedroom. We're repainting this wall white to freshen it up and make it pop again. The previously painted white wall displays every little detail, mark, & ding. Naturally, we want our wall to be perfect and flawless again. It does not mean we want it to be a totally different color nor do we want a heavy amount of paint slapped on. The overall goal is to bring the wall back to life again by giving it a fresh look. The same idea goes into play for airbrush makeup, traditional makeup, and perfecting the skin for a flawless finish. Like traditional makeup, airbrush makeup has an assortment of formulas based on the finish you are trying to achieve. When it comes to flawless makeup (whether it's traditional or airbrush) the overall finish is heavily based on skin prep and the artist. For instance, if someone is oily we would not apply a heavy hydrating cream but rather opt for a light lotion and matifying primer before the makeup. We base our application choice on the desired effect from the client and disadvantages of each technique. offers a bond that will stay strong for 6 to 8 hours (realistically). the product doesn't work work well with sunburn, excess hair, or dry skin. The fine mist will pick up any fine hairs or dry skin patches. We’ve had clients love their airbrush makeup look so much they want to know where can they buy a machine for themselves. So the question is, “Do you wear airbrush makeup everyday?” My answer is YES. I personally love the product because it does not budge and it feels like I have nothing on my skin. For our brides, we use the Temptu SB formula. The silicone base makeup holds up nicely when it’s wet and binds to the skin for a 6-8 hour wear. Airbrush makeup before and after displays the length of wear and the staying power of airbrush makeup. I decided to put the wearability of airbrush makeup to the test by creating my own before and after look. Above you will find the makeup I applied at 8am in the morning. My work day consisted of hiking a mountain, crossing over rivers, and finishing at a waterfall. At the end of the day everything stayed in place without one touch up. Both airbrush and traditional makeup applications are great options for an important event. The key factor for amazing wedding day makeup is the person behind the service. Make sure your local makeup artist has a clear understanding of both makeup applications and the look you are trying to achieve. During the inquiry stage ask as many questions as possible. Questions help create a clear line of communication and it makes our job easier as wedding stylists. We've put together some key questions to ask your professional/wedding makeup artist, here. If you’d like to check out our standard bridal airbrush pricing you can find comparable airbrush rates, here. Hopefully this will give you good general idea of the average airbrush makeup price. If you love this post or have any questions please don’t hesitate to comment below.